See the exhibition Abstruction: The Sculpture of Erick Swenson, then delve more deeply into the meaning of art. Want VIP access to the Nordstrom Beauty Trend Week Cocktail Hour, held Friday, May 4? Solve the following riddle and present the solution to the Nordstrom table at the front of the museum—the first twelve (12) guests to present the correct answer receive a pass to the most fashionable party in town! Nordstrom Ala Moana is one of only nine stores hosting this exclusive beauty event. 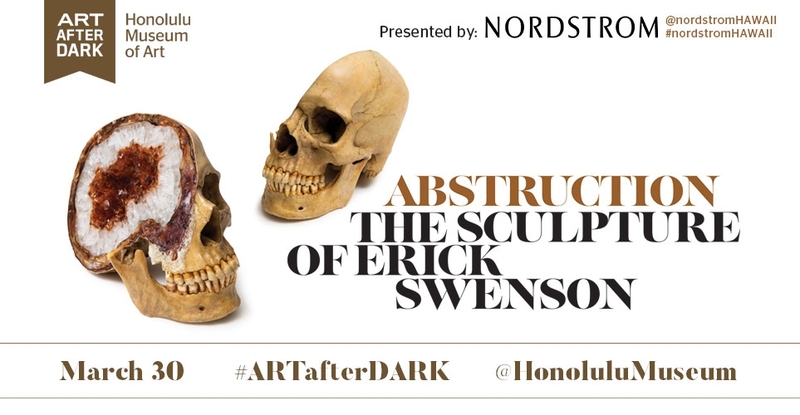 • Abstruction: The Sculpture of Erick Swenson makes its ARTafterDARK debut with free admission (normally $10). • The first (250) guests to enter can enjoy a rock candy treat (we imagine the ensuing sugar rush looks like I Am What I Isn't). • DJ Davey Shindig brings his unique sound to Luce Courtyard. • Get a shimmery, skull-like makeover from Jonathan Frietas, inspired by works in Abstruction. • Garage-pop band The Bougies rock in the Kinau Courtyard starting at 7:30pm. • Consider Erick Swenson's creative process in the Constructing Abstruction activity, located in Gallery 28. One winner will receive an exhibition catalog! • This month's specialty cocktail is the Hibiscus Margarita.